Occupational health never sought me out and my GP and the DWP (Department for Work and Pensions) never told them about my disability. I had to find them – down a long steep driveway, in order to start the process of getting a downstairs toilet. All I wanted was a downstairs toilet so I wasn’t restricted to my bedroom like it was a prison. At first, they didn’t want to give me that. The cheapest offer was a stair lift – impractical in narrow curved stairs. Then an actual lift, which could only be put in the furthest corner of the house from the upstairs toilet. They never asked about how imperative it is that I get to a toilet quickly, otherwise these slow options would never have been suggested. Then they said I had to have an entire downstairs wetroom, as they said they were thinking about my future in a wheelchair. You may see after reading this that their ability to think about my present and future needs was detached from reality. Coincidentally, the project had approval the day after I said, “It doesn’t matter how long it takes. It’s not like I’m dying any time soon.” The build took all winter. We couldn’t have the heating on as the doors were permanently open with passing workers. The cold and the masonry dust and 8am starts were bad for my health. As a comparison, when local council homes had their exteriors pebble dashed, the families were given caravans to live in on their driveways. We didn’t get that. We had to put up with the gas, water and electricity being turned off periodically. The work ethic was so poor that they were going to leave us without any downstairs plumbing for two weeks over Christmas. The council architect fetched them back and they made a temporary fix so we could do laundry and wash up. The architect wanted to take out a radiator to build a wheelchair-wide door but didn’t want to widen any other door in the house. Their vision of my future mobility was restricted to the kitchen and wetroom, as the new wheelchair-wide back door had steps rather than a ramp. The architect failed to put a window in the wetroom to the outside world. It saved council money, but pushed costs onto us with having to switch the light on every time we went in there. The fan comes on with the light and stays on for 20 minutes after being switched off – more electricity. Our options were limited. The wetroom wall tiles were either white, or wavy white. The workers said it was the council restricting how much could be spent on each item. Compare this to what MPs get. The kitchen sink is flimsy. The paint peeling. The work surfaces not heat proof. The kitchen taps are not disabled friendly. I lamented that such low quality things are allowed to be made and that the main thought is short term money saving, not long term use. No one talked to me about my particular needs. If they had, the build would be a downstairs toilet and a walk-in bath. Baths are much better for managing my health than a shower with a concrete floor, which gets no natural light. It hurts to walk in there dry with the cold, let alone the wet. By far the worst aspect was the combi-boiler. A boiler that saves you money as it doesn’t work when it’s cold – no one ever thought a water waste product problematic in a sub-zero climate. The eco setting of 35 C is a health risk when washing up as it’s optimum temperature for microorganisms is harmful to humans. I have to live with the council decisions on materials that are not fit for purpose. 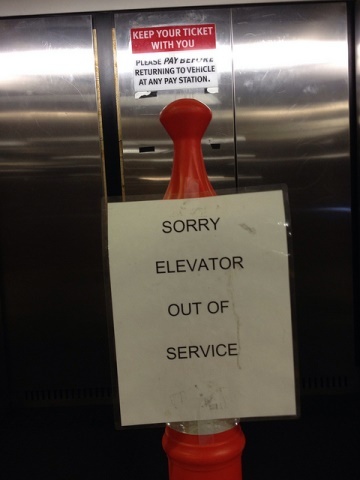 Image is of a typed sign on a life, it reads “SORRY ELEVATOR OUT OF SERVICE”. It was shared by Flickr user torbakhopper HE DEAD and has been shared under the Creative Commons Licence.